The examples have very different outcomes. A constructor's prototype provides a way to share methods and values among instances via the instance's private [[Prototype]] property. A function's this is set by how the function is called or by the use of bind (not discussed here). Where a function is called on an object (e.g. myObj.method()) then this within the method references the object. Where this is not set by the call or by the use of bind, it defaults to the global object (window in a browser) or in strict mode, remains undefined. In this case, variable A is assigned a value that is a reference to a function. When that function is called using A(), the function's this isn't set by the call so it defaults to the global object and the expression this.x is effective window.x. The result is that a reference to the function expression on the right-hand side is assigned to window.x. In the second line, A.prototype.x is assigned a reference to a function. This will create an x property if it doesn't exist, or assign a new value if it does. So the difference with the first example in which object's x property is involved in the expression. In this example, the new operator has been added before the function expression so that the function is called as a constructor. When called with new, the function's this is set to reference a new Object whose private [[Prototype]] property is set to reference the constructor's public prototype. So in the assignment statement, the x property will be created on this new object. When called as a constructor, a function returns its this object by default, so there is no need for a separate return this; statement. In this case, A assigned the return value of calling the function on the right-hand side. Here again, since this is not set in the call, it will reference the global object and this.x is effective window.x. Since the function doesn't return anything, A will have a value of undefined. console.log(instance.prototypeProperties); // "are NOT serialized"
Sidenote: There may not be any significant memory savings between the two approaches, however using the prototype to share methods and properties will likely use less memory than each instance having its own copy. As others have said the first version, using "this" results in every instance of the class A having its own independent copy of function method "x". Whereas using "prototype" will mean that each instance of class A will use the same copy of method "x". // x is a method assigned to the object using "this"
// Here x is a method assigned to the object using "prototype"
As others have mentioned, there are various reasons to choose one method or the other. My sample is just meant to clearly demonstrate the difference. A.prototype is TOTALLY DIFFERENT from the __proto__ property. In our example, 'A' now has TWO properties called 'prototype' and __proto__ . This is a big confusion for people. prototype and __proto__ properties are in no way related, they're separate things pointing to separate values. There's something happening in the background when this thing happened. a1 is an ordinary variable which was assigned a new, empty object. We said that on each function definition there's a new property created called prototype (which you can access it, unlike with the __proto__ property) created? Well, that property is being used now. I won't cover why this changes to a1 but this is a great answer to learn more. Steps 1,2,3 will repeat. Do you notice something? The key word is repeat. Step 1: a2 will be a new empty object, step 2: its __proto__ property will point to the same thing A.prototype points to and most importantly, step 3: function A() is AGAIN executed, which means that a2 will get hey property containing a function. a1 and a2 have two SEPARATE properties named hey which point to 2 SEPARATE functions! We now have duplicate functions in same two different objects doing the same thing, oops...You can imagine the memory implications of this if we have 1000 objects created with new A, after all functions declarations take more memory than something like the number 2. So how do we prevent this? Remember why the __proto__ property exists on every object? So that if you retrieve the yoMan property on a1 (which doesn't exist), its __proto__ property will be consulted, which if it's an object (and is most cases it is), it will check if it contains yoMan, and if it doesn't, it will consult that object's __proto__ etc. If it does, it will take that property value and display it to you. It will see that a1 does not contain hey and it will check its __proto__ property object to see if it has it, which is the case. With this approach we eliminate the part from step 3 where functions are duplicated on each new object creation. Instead of a1 and a2 having a separate hey property, now NONE of them has it. Which, I guess, you figured out yourself by now. That's the nice thing...if you understand __proto__ and Function.prototype, questions like these will be pretty obvious. NOTE: Some people tend to not call the internal Prototype property as __proto__, I've used this name through the post to distinguish it clearly to the Functional.prototype property as two different things. In most cases they are essentially the same, but the second version saves memory because there is only one instance of the function instead of a separate function for each object. The first example changes the interface for that object only. The second example changes the interface for all object of that class. console.log(subClass.getText()); // SubClass says: Hello BaseClass! If you think this is not a problem, then it depends on whether you can live without private variables, and whether you are experienced enough to know a leak when you see one. Also, having to put the constructor logic after the method definitions is inconvenient. The prototype property of a function constructor refers to the prototype object of all instances created with that function when using new. In your first example, you are adding a property x to each instance created with the A function. In the second example you are adding a property to the prototype object that all the instances created with A point to. In conclusion, in the first example a copy of the function is assigned to each instance. In the second example a single copy of the function is shared by all instances. What's the difference? => A lot. I think, the this version is used to enable encapsulation, i.e. data hiding. It helps to manipulate private variables. Different adults have different ages, but all of the adults get the same rights. So, we add it using prototype, rather than this. Lets look at the implementation now. Prototype is the template of the class; which applies to all future instances of it. Whereas this is the particular instance of the object. Most answers mentioned the difference already, i.e. when prototyping the function is shared with all (future) instances. Whereas declaring the function in the class will create a copy for each instance. In general there is no right or wrong, it's more a matter of taste or a design decision depending on your requirements. The prototype however is the technique that is used to develop in an object oriented manner, as I hope you'll see at the end of this answer. You showed two patterns in your question. I will try to explain two more and try to explain the differences if relevant. Feel free to edit/extend. In all examples it is about a car object that has a location and can move. Not sure if this pattern is still relevant nowadays, but it exists. And it is good to know about it. You simply pass an object and a property to the decorator function. The decorator returns the object with property and method. In this case Car is a function (also think object) that can be invoked as you are used to do. It has a property methods (which is an object with a move function). When Car is invoked the extend function is called, which does some magic, and extends the Car function (think object) with the methods defined within methods. This example, though different, comes closest to the first example in the question. The first two patterns allow a discussion of using techniques to define shared methods or using methods that are defined inline in the body of the constructor. In both cases every instance has its own move function. The prototypal pattern does not lend itself well to the same examination, because function sharing via a prototype delegation is the very goal for the prototypal pattern. As others pointed out, it is expected to have a better memory footprint. However there is one point interesting to know: Every prototype object has has a convenience property constructor, which points back to the function (think object) it came attached to. In this example Car links to the prototype object, which links via constructor to Car itself, i.e. Car.prototype.constructor is Car itself. This allows you to figure out which constructor function built a certain object. amy.constructor's lookup fails and thus is delegated to Car.prototype, which does have the constructor property. And so amy.constructor is Car. Furthermore, amy is an instanceof Car. The instanceof operator works by seeing if the right operand's prototype object (Car) can be found anywhere in the left operand's prototype (amy) chain. The instanceof operator returns false, because Dog's prototype cannot be found anywhere in fido's prototype chain. fido is a simple object that is created with an object literal, i.e. it just delegates to Object.prototype. This is really just another form of the prototypal pattern in simplified form and more familiar to do those who program in Java for example, since it uses the new constructor. It does the same as in the prototypal pattern really, it is just syntactic sugar overtop of the prototypal pattern. Finally, it should not be too difficult to realize how object oriented programming can be done. There are two sections. One section that defines common properties/methods in the prototype (chain). And another section where you put the definitions that distinguish the objects from each other (loc variable in the examples). Feel free to add or edit. Once more complete I could make this a community wiki maybe. I know this has been answered to death but I'd like to show an actual example of speed differences. 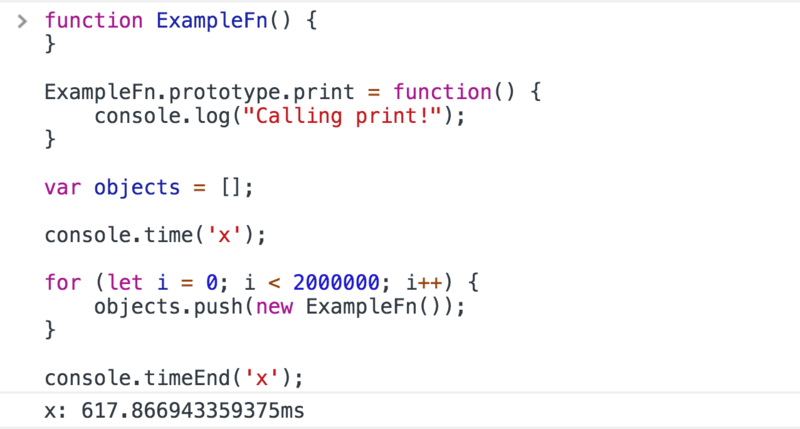 Here we're creating 2,000,000 new objects with a print method in Chrome. We're storing every object in an array. Putting print on the prototype takes about 1/2 as long. I believe that @Matthew Crumley is right. They are functionally, if not structurally, equivalent. If you use Firebug to look at the objects that are created using new, you can see that they are the same. However, my preference would be the following. I'm guessing that it just seems more like what I'm used to in C#/Java. That is, define the class, define the fields, constructor, and methods. As discussed in other answers, it's really a performance consideration because the function in the prototype is shared with all of the instantiations - rather than the function being created for each instantiation. I put together a jsperf to show this. There is a dramatic difference in the time it takes to instantiate the class, although it is really only relevant if you are making many instances. Think about statically typed language, things on prototype are static and things on this are instance related. Advantages of using prototype, vs defining methods straight in the constructor? Setting methods through prototype object or in constructor, difference? What is the difference between extending an object using prototype or inline?